In a large pot, heat butter and oil. Add carrots, corn and leeks. Cook covered, stirring occasionally, until they begin to soften, about 5 minutes. Remove cover and add remaining ingredients. Bring to a boil then lower heat and cook until potatoes are easily pierced with a fork, about 30 minutes. Serve hot. This is another recipe that really highlights fresh ingredients. The subtle flavors of celery, carrot and corn really shine. 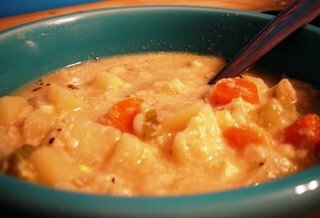 I used milk in this recipe instead of the heavy cream usually present in chowder, this gives it a lighter mouth feel that I really think works well and doesn't overpower the veggies.